“We’re changing the sensor at the top of the tower that measures the wind direction,” explains Wilson, a burly meteorological electronics technician with a big beard and a booming laugh. When this station — No. 84 — is back online, it’ll resume beaming bursts of observations on more than a dozen factors, including wind and air pressure, temperature, soil moisture and solar radiation. 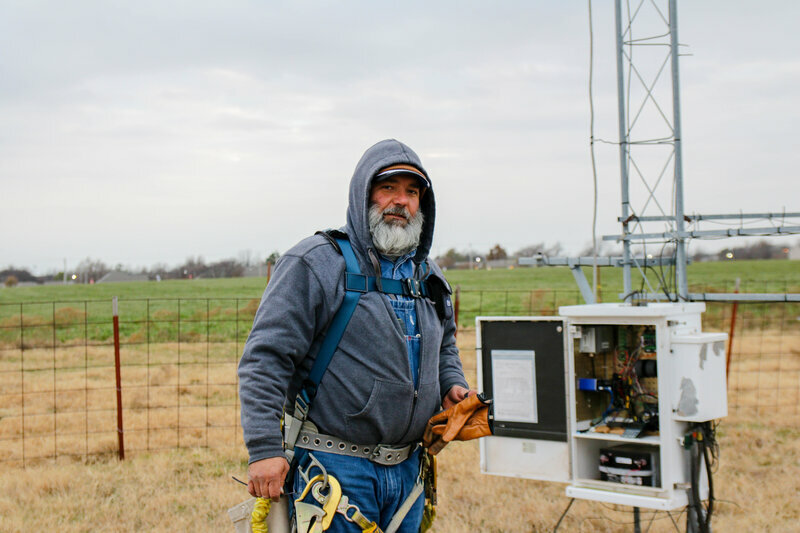 Meteorological Electronics Technician Kirk Wilson stands at the base of a 30-foot tower near Shawnee, Okla., after replacing a wind sensor that will feed data to the Oklahoma Mesonet. “We’re not only collecting the data every five minutes, but we’re trying to get it out to the decision-makers within five minutes,” says Chris Fiebrich, associate director of the Oklahoma Climatological Survey who manages the Oklahoma Mesonet. Those decisions could be small ones, like postponing a high school football game, or ones with much higher stakes, such as predicting catastrophic flooding, or drought, or modeling potential wildfire danger. “Firefighters can know how fast a fire might spread if it were to break out today, or how high the flames might be, and that helps them preposition things or get things ready,” says Fiebrich. “There’re enormous possibilities for how we could use early warning systems to make our health systems much more effective,” says Kristie Ebi, a professor at the University of Washington who studies the health risks of climate change. Information isn’t the same thing as action, however, and Ebi says generating and making data available doesn’t guarantee a decisive response. Researchers published a scientific paper, which received national media coverage, “but there was essentially no significant public health response,” Ebi says. The next step, she says, is finding, funding and empowering a public response to the increasingly accurate predictions about the effects of climate change.